The summit of Haleakalā is a place of extremes where the descriptive phrase summer every day and winter every night may be applied. Climate is a primary determinant of the environmental conditions in which the plants and animals of the alpine/aeolian zone live. This unit helps students explore the climate of this region and take from that exploration a working understanding of many of the environmental conditions to which alpine/aeolian residents are adapted. These conditions include wind, dramatic temperature fluctuations between day and night, intense sun exposure, freezing temperatures, and little moisture. #1 - What’s the Temperature at the Summit? 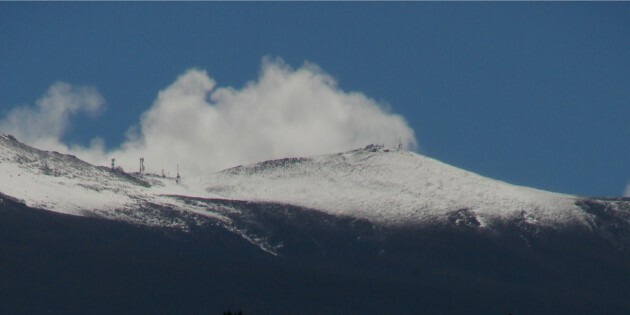 Students predict the temperature at the summit of Haleakalā based on the current temperature at their school, and discuss possible explanations for differences between their calculations and the actual temperature. By investigating and learning about the climate conditions that form the mauna lei, or the layer of clouds that often rings Haleakalā, students learn about the environmental conditions of the alpine/aeolian ecosystem. Students analyze temperature information available on the Internet to draw conclusions about the applicability of the statement “summer every day and winter every night” to the alpine/aeolian ecosystem. 1. What factors influence the climate in the alpine/aeolian ecosystem? 2. What are the environmental conditions in the alpine/aeolian ecosystem? Climate of the summit area. Climate is a key factor in shaping the environmental conditions to which life in the alpine/aeolian zone is adapted. • Use information available on the Western Regional Climate Center website (which gives daily and archived weather) to research other weather and climate-related questions about Haleakalā. • Based on their work in this unit, especially the presentations in Activity #2 “Mauna Lei Mystery,” have students create educational displays about why the mauna lei forms around Haleakalä, or more generally, about the climate of the upper slopes of the mountain. Display these in the school cafeteria or another prominent location. Nullet, D. and M. Sanderson, Radiation and Energy Balances and Air Temperature, in M. Sanderson (ed. ), Prevailing Trade Winds: Weather and Climate in Hawai’i, University of Hawai’i Press, 1993. Schroeder, T., Climate Controls, in M. Sanderson (ed. ), Prevailing Trade Winds: Weather and Climate in Hawai’i, University of Hawai’i Press, 1993.